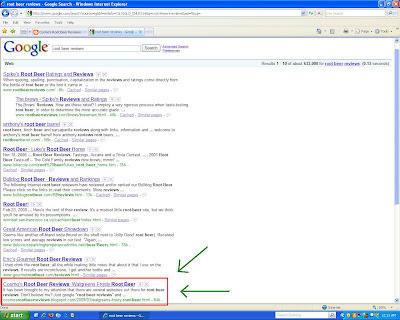 That's right folks... my root beer blog is on the first page of a Google search. Granted, it's at the very bottom of the first page, but with YOUR HELP, it can be one of the first authorities people turn to for honest, biased, reliable root beer reviews, just as they should be. People need this info, so tell your friends to come check out the blog. Comments are always welcome, but just know if you disagree with me that you are clearly wrong. Thanks for the support everyone, and all i can really say is... Spike... Anthony... watch you back. 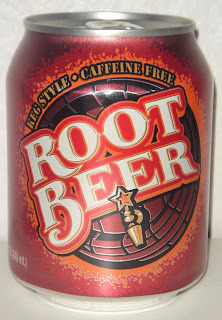 This is another one of the "generic" root beers that comes from a big line. Big K sodas come in various flavors and are part of the Kroger family (that link isn't much help when looking up info on Big K, but i couldn't track down any better links). Kroger is not a store, per say, but is a brand of low priced goods in all varieties sold in stores. Kroger makes everything, from sodas to baby wipes to cereal to these terrible little butter cookies that my wife thought were so delicious over the holidays and which we ended up buying several boxes of and throwing most of them out. Anyway, they cover the whole spectrum to try and make a low budget knock off of every product ever for the savvy shoppers out there. Basically, it's synonymous with cheap on many levels and for many reasons. That being the case, Big K is an inexpensive soda, and in the past i have often equated it with Shasta sodas in value and quality. But after the recent revelation that my entire childhood was based on a lie perpetuated by Shasta Root Beer (which is just plain worthless), i have looked at Big K with new eyes. So Big K, are you here to crush my reality also? I don't know if i can stand getting my feet swept out from under me like that again. A lot of websites i have looked at say that Big K is definitely a good tasting root beer for the cost, and therefore carries a fair amount of value. Here is my opinion... spend a little extra. That's not to say Big K is terrible. It's not, and it's certainly better than many root beers i have tried, including Shasta. But it's nothing special at all. You might as well throw down a bit more cash and pass over value for quality. 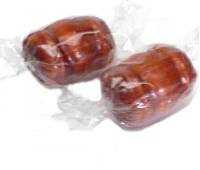 To tell you exactly what it tastes like, you would have to know what the root beer barrel candies taste like. Have you tried those? Well that's exactly what Big K tastes like. No surprise there, right? It's just straight root beer extract mixed with carbonated water. Nothing amazing, but at least it didn't leave me crying in a corner (again). My official review is that Big K Root Beer gets 4 (four) IBCs. The low low price is just another one of Kroger's gimmicks. Like the crappy butter cookies, you might start off thinking you really like it and congratulate yourself on a good buy since it's so inexpensive. But in the long run, you just wish you could get a decent root beer after a long day and really begin to question the standard you have set for yourself while choosing a root beer. "Is this really what i want out of my root beer consuming life?" (I'll answer that for you). NO. If you're into the cheap stuff, swing by Safeway and pick up some Parker's. It's inexpensive and actually good. BUT, i wouldn't be me if i didn't tell you that IBC is always the best value for the price. It comes in a 12 oz. stout brown glass bottle, which is my favorite bottle next to IBC. The label is very colorful, and as i mentioned above has a picture of a classic car. The name of the soda is printed as a road sign. This one says "Root Beer 101", but if you got a different flavor it would say "Strawberry 101" or whatever. Apparently Strawberry is a pretty popular flavor for these guys, but let's just stick to root beer, shall we? Anyway, when i first picked it up i called it Route 101 Root Beer and it immediately reminded me of Route 66 Root Beer, which we all remember as a terrible attempt at producing a consumable beverage. That stuff is terrible. But i am glad to say 101 Root Beer is not terrible. In fact, it is far from it. Yes, 101 Root Beer is very good. They live up to the hype (to a certain degree) and put out a solid root beer. It has a nice taste of honey, and Thomas Kemper would do well to take notes on the amount of honey to use from 101's example. It's not overpowering in the slightest and makes for a really good tasting root beer, which may be the first one with a good honey taste that i actually like. 101 also uses cane sugar, which gives it a sweet, sugary aftertaste that isn't sickly sweet like the most terrible drink on Earth (that being Weinhard's). 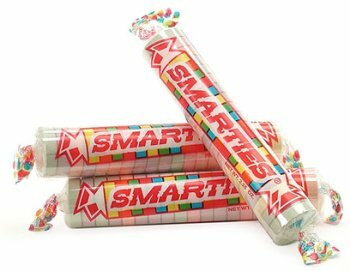 My wife says it tastes like candy, and i agree that it kind of gives me the impression of eating smarties. All in all though, it's a great root beer. It's not IBC, but it's in the caliber of some of the finer root beers i have sampled in my long and illustrious career. My official review is that 101 Root Beer gets 8 (eight) IBCs. In my book, this one is indeed an instant classic. I am not so much drawn to the car thing as i am not a big gear head or into classic cars as much as i am into great root beer. Well luckily, this one has it all. Well done 101 Root Beer. My hat is off to you. Not unlike Safeway's line of Safeway Select sodas, Walmart had a line called Sam's Choice back in the day. Well Sam's Choice is harder to come by these day, but also not unlike Safeway, Walmart has rolled out a line of named sodas such as Dr. Thunder and Mountain Lightning, because apparently drinks named after weather are a sure thing. This new line has replaced the Sam's Choice line, so this means they put out a root beer also, and they came up with a super clever name for it. Are you ready for this? It's called... Root Beer. Yup. That's what it's called (wait till you see what they named their ginger ale...). So to designate it from others, i am calling it (Walmart) Root Beer, because i can come up with just as catchy a name as they can. Anyway, this is another mega-store attempt to pull out some cash from the soft drink industry bankroll, so i'm not sure how long it's been around. Let's just say i noticed it about 4 months ago. Good enough, right? This is probably going to be a short review, which is fitting considering the can. I picked up a six pack of adorable 8 oz. cans (awwww...), though it is available in 12 oz cans also. These things are just so freakin' cute though, right? The downside is that i just start getting a taste for it and it's gone. But still, the cute factor might be worth it. Plus i think it costs less than a 6-pack of 12 oz.ers (at least i would hope so). The label is pretty fun. It has a picture of a root beer barrel and a little star on the spout which helps give it mass appeal. I don't know if it actually does that, i just made it up. Fairly simple colors in the reddish, rust, orange, brown, root beery range. Not bad Walmart. Again, i don't expect a lot from these store brand root beers, and so far i have been more than pleasantly surprised by all of them. Walmart is no exception. In a nutshell, it's pretty good. It doesn't have anything particularly amazing to it, but it's just a solid, good, well rounded root beer flavor with a good amount of carbonation. My official review is that (Walmart) gets 6 (six) IBCs. I am feeling pretty generous with this one. To be completely honest, nothing really sets this apart from most of the 5's, but i just got home from a long day of school and work and this root beer complimented the nachos i had for dinner quite well. So thanks (Walmart) Root Beer. You get a 6. You're welcome.